The research methods we will show you will only enable you to raise a red flag if a company is paying a low rate of tax. It will not enable you to say that a company is evading tax or breaking the law. To make these accusations carries significant legal risks and is not recommended without expert help. In Chapter 1 we outlined how companies can arrange their affairs to avoid tax. MNCs can shift profits on paper to different national jurisdictions with lower tax rates. National companies can evade or avoid paying taxes, often through corruption at the local level. When campaigning at the local level, the link between an MNC’s tax behaviour and a situation on the ground is not always obvious. But if a company is not paying the taxes it should, ultimately it is citizens who are deprived of services. Secrecy and lack of transparency in financial reporting are factors that enable international tax dodging to take place. They also make it difficult to research companies. This section will explain the different types of business taxation, then we will walk you through the steps to a successful research project on MNC taxation. The typical tax-related research question when looking at a company is quite simple: Does this company pay a fair amount of tax in your country? Companies may also be assisting others in tax dodging and be active in the so-called ‘tax avoidance industry’. Or you may be dealing with banks that invest in companies that are violating environmental and labour laws as well as engaging in tax evasion or avoidance. Furthermore, tax may be linked to corruption in your country, with politicians granting illegitimate tax deals to national and multinational corporations. Finally, you may think that the tax rates imposed on the company in question, or the tax exemptions it has been given by the government, might be unjust. Here, however, we will only deal with questions you might ask in relation to how much tax companies are, or should be, paying by law in your country. Corporate income taxA tax on the profits made by limited liability companies and other similar entities. The tax is generally imposed on net taxable income, specified in the company’s financial statements. The rate of tax varies by jurisdiction. The tax may have an alternative base, such as payroll or unearned income, for example from investments and property. Royalties are usage-based payments for the ongoing use of an asset, for example natural resources such as oil and minerals, but also intellectual property. Royalties are typically agreed upon as a percentage of revenues raised from the use of an asset. A royalty interest is the right to collect future royalty payments (a percentage ownership of future production or revenues from a given leasehold). Payments made towards a fund maintained by government, usually used to pay pension and unemployment benefits. Health benefits are sometimes covered as well. Social security contributions are generally considered to be taxes. Tax deducted from a payment usually made to a person outside the country. This generally applies to investment income, such as interest, dividends, royalties and licence fees. A tax on the profits from the sale of capital assets such as stocks and shares, land and buildings, businesses, and valuable assets such as works of art. Taxes on sales can be levied in two ways: first, as a goods and services tax (GST) added to the value of all sales with no allowance for claiming a rebate on tax paid; and secondly, as a value added tax (VAT) charged by businesses on sales and services but which allows businesses to claim credit from the government for any tax they are charged by other businesses. The burden of VAT therefore falls almost entirely on the ultimate consumers. Trade tax is an important source of income for governments and is levied on companies’ trade earnings. A tax on the value of contracts, usually charged on contractual dealings on shares and other stocks and securities and on dealings in land and property. Note that when multinationals negotiate with governments, many of these taxes may be reduced or exempted, so before you do your research on company tax contributions try to find out what taxes are actually due. What is a fair amount of tax which the company should pay? Does it comply? Has the company demonstrated willingness to tax compliance? Have tax authorities questioned the company’s tax payments? How does it report on its profits and taxes in its annual financial report? What does it say in its explanatory note to the tax payments in the consolidated income statement? If it pays less than a fair amount, are there indications as to what tax avoidance strategy it is using? Does the company belong to a foreign multinational? What is the company structure? Which annual report reveals tax-relevant information about the company? Are its subsidiaries located in secrecy jurisdictions without having substantive operations there? Does the company make use of subsidiaries to lower its tax payments? What are the transfer-pricing practices of the company? Do subsidiaries use accelerated depreciation methods?When looking at data from the tax haven subsidiaries or from the ultimate parent company, are there interest payments to tax haven subsidiaries from the local company accounts? In many ways, preparing your research on company taxation follows the same steps as those outlined above in government tax policy research. The question you need to answer first is: What information do I need and how do I get it? In order to answer this question, first map organisations that have already researched and published on tax justice issues and the specific company you are looking at. Start with a far-reaching internet search for the company’s name – it’s amazing what you can turn up by going as far as page 20 of the results. Next, search the internet for non-governmental organisations (NGOs) and social movement campaigns that may have already targeted the company in question or worked on the issue of tax justice. Some of these organisations also provide research guides and a list of sources you can consult to find company information for your preliminary research and collection of primary data. Once you’ve mapped out your field and identified what kind of information is missing to provide evidence for your advocacy efforts, choosing your methodology and entry point is crucial. Do you want to understand the total impact of tax dodging on your country or to investigate a single company? Is your sector/country listed with data from the year you require? YES: Consider the resources needed and engage in research. NO: Contact organisations that may have experience in this area or look at the local perspective. Answer: A single company – You should choose company research. Do you have access to the company reports in question? YES: Hire a researcher, allocate resources and get going. NO: Can you hire somebody for the research who has access? YES: Consider time and resources, and get going. NO: You need to change company/sector or approach. Before starting to conduct the research, you’ll need to work out the availability of the data, which is usually the major constraint to a successful research outcome. Before delving into the primary data research, map your available sources and assess the feasibility of carrying out the research, including outsourcing some parts of it to consultants (accounts, lawyers, economists) if needed. For preliminary research, you can turn to the organisations listed above. Have a look at the research guides provided on their websites and consult the list of sources they suggest. You may also want to investigate tax courts, government department websites, press statements from stock exchanges, and reports filed with regulatory bodies. Once you know your possible partners, existing research and available sources, make a research plan with a realistic time frame. In the section ‘Researching government tax policy’ above, we outlined good practice in planning research, developing terms of reference and identifying timescales. The resources you need for company research may be different than for government policy research. You’ll need access to different databases. Sometimes these reports are freely accessible, but in other cases you need to pay subscription fees. You should be aware of the risks of doing company research. You may invest significant resources only to find what you suspected to be untrue. You may face delays in verifying claims about a company, and even if you are certain about malpractice you may be unable to publish due to legal risks. Although it is specific to the US, have a look at the guide on How to Do Corporate Research by the Corporate Research Project. Remember: MNCs are often headquartered in large economies such as the US or countries with an attractive tax regime. Now, it’s time to start familiarising yourself with financial reports and, in case you are dealing with an MNC, with company structures. Existing data can assist you in the identification of possible malpractices, and can then be used to dig deeper, make plans for further research and start a dialogue with, or start a campaign targeting, companies. Because tax evasion and avoidance are made possible through the use of global profit-shifting and inter-firm trade, we concentrate here on MNCs. In order to read the financial statements of an MNC, it is important to first understand its structure. The section below will guide you step by step through finding out how an MNC is structured, where you can find a financial report relevant to tax, and how to read it. It highlights issues that might indicate an irregularity in the company’s tax payments and suggests further steps. In Chapter 1 we explained how transfer-pricing abuse involves the manipulation of prices of transactions between subsidiaries of multinationals or, more specifically, the sale of goods and services by affiliated companies within an MNC to each other at artificially high or low prices. A similar practice can occur between unrelated companies. This is called false invoicing. Together they are usually called ‘trade mispricing’. If your research question involves looking at the big picture to analyse how much your country may be losing as a result of trade mispricing, you can look at national and international statistics. Christian Aid, in its report False Profits: Robbing the Poor to Keep the Rich Tax Free, estimated the amount of mispricing between non-EU countries and the EU and the US. On the basis of this, the organisation estimated the amount of potential tax revenue lost by each country. While this is a relatively crude way to estimate the losses, it can provide useful evidence for advocacy and the need for further investigation. The UN Comtrade database can also be used for similar types of investigation. the quantity and value of commodity trade between countries (if reported by one of those countries). By comparing export prices between countries and those of world market prices, you can estimate how much mispricing has occurred between one country and another in the trade of a particular commodity. there are no large quality differences within a commodity classification, allowing you to assume that there is a single price for this commodity (for example industrial diamonds). To learn more about using the UN Comtrade database, contact SOMO (www.somo.nl). As mentioned above, an MNC is a web of cross-owned companies which are liable for tax on an individual basis. 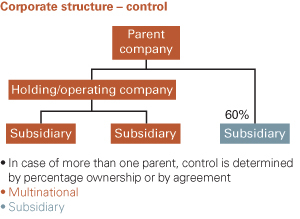 A controlling parent company will control several subsidiaries in different formations. Each subsidiary has its own books. Let’s have a look at what some companies may look like. In many cases, intermediary companies are established for bringing together aspects of the company’s business operations. These intermediary companies can be called ‘holding companies’, ‘international trade companies’ or even ‘letter box companies’, ‘conduit companies’ and ‘shell companies’. The last three clearly imply that the companies have no real operations but simply are used for financial or legal operations. It is not necessary to map the whole structure of a corporation to find out whether it owns subsidiaries located in tax havens. In fact, a large MNC may have thousands of subsidiary companies worldwide so it is inefficient and usually impossible to describe the complete corporate structure. Before you search specialised databases, always check the company website. Use a search engine to find the corporate website. Often the web address will be www.nameofcompany.com. It will generally give you much of the information found also in the annual and other reports, and often more. You may want to focus on the sections on investor relations and news releases. Company websites will often include a list of branches, subsidiaries, facilities and locations; an overview of company operations; company policy on some corporate social responsibility (CSR) issues; stock exchange filings; annual and CSR reports; product listings; a list of executives; and other useful information. Sometimes subsidiaries in different countries have separate websites. It is worth checking these if you are searching for information about a company in a specific country. Publicly listed companies have to inform their (potential) shareholders and provide annual reports and other investor information. Private companies have fewer reporting obligations and may not publish annual reports. Finding information on these companies can be difficult and requires alternative sources, such as the business press and the internet. Use the internet to search for a company in relation to the jurisdictions you are investigating. If possible, access annual company reports from countries where the parent company is listed on a stock exchange or headquartered. In many cases, this will provide you with a list of subsidiaries by location. Finding that a company has a subsidiary in a secrecy jurisdiction or a tax haven isn’t yet proof that this subsidiary is used for tax dodging. It provides a first step to point you towards the need for further investigation. Often an internet search can assist you in getting an idea of the specific operations of this company in the secrecy jurisdiction. Dun & Bradstreet search engine can be used to check for all subsidiaries in a specific country (including tax havens). Use www.dnb.com > advanced search (the same search engine is available via Lexis Nexis). Search on company name and country. Mint database of Bureau van Dijk has a free company search engine (see the ‘General’ section in the TaxTracker directory). Yahoo! Finance provides access to some consolidated data on companies, which can be one of your starting points (http://finance.yahoo.com/search). the related companies with which your subsidiaries have relationships. It makes sense to start with 1 and 2 in parallel; 3 comes later. For example, you may be able to find the name of the subsidiaries in your country via the MNC’s accounts. If you can get the subsidiaries’ accounts, they usually tell you the name of the intermediary holding company (or if it’s registered on the local stock exchange, you can get shareholding information). You can piece together bits of information by working in both directions – get accounts of whatever subsidiaries you can, and often you are able to fill in the gaps. 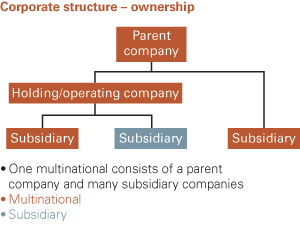 The main source of the overall financial structure (sometimes called holding structure) of a multinational is the consolidated annual report of the parent company. You want to identify whether the company has internal financing companies that might play a crucial role in tax avoidance strategies or other dubious financial constructions. Consolidated financial statements or financial report. This is the second part of a full annual report. NB: Consolidated statements include financial information of the company and all its subsidiaries of which it holds 50 per cent or more. Historical overview with figures over the last 5 or 10 years. Such an overview is usually not included in annual reports and can be helpful to analyse developments over time. Some companies also publish a sustainability report or a corporate responsibility report. Such reports may contain additional financial information, so it is a good idea to download these as well. The Global Reporting Initiative has a guideline on reporting on tax which may make it easier to find tax information in the CSR report. Keep in mind that in order to gauge the tax contribution of a company, you need to look at the past five years of its financial reporting. This is because tax payments depend on profits and losses which fluctuate considerably over the years. When searching financial information such as annual financial reports, therefore, always save the past five years. Subsidiary names that include the words ‘Finance’ or ‘Insurance’ suggest a role of a subsidiary in the financing of the company. Especially when these financing companies are located in tax havens, it is worthwhile to retrieve the chamber of commerce reports of these companies to check their balance sheet. If it becomes clear that large amounts of money appear on this balance sheet, you should dig deeper. Engaging with the company may provide answers to some of your questions. Operational review. The operational review describes how the business and strategy of the company have developed over the past year. It includes a general description of the company’s business and an analysis of the markets in which the company operates. Sometimes it has separate chapters on different business divisions. Although the operational review includes many graphs and tables with financial data, this part of the report is not so relevant for a financial analysis. Usually all the financial data in the operational review is also included in the financial statements, often in a more structured way and in more detail. Statement of directors’ responsibilities. This is a short section explaining the responsibilities of directors with regard to the preparation of the financial statements. Independent auditor’s report. This section indicates the information in the annual report that has been audited, explains the responsibilities of the auditor, and gives the opinion of the auditor about the financial report. Consolidated balance sheet. The balance sheet provides an overview of all assets to which the company is entitled and of the company’s liabilities to other parties at the end of the year. Consolidated income statement. The income statement provides an overview of the revenues and costs of the company over the past year. It also includes the company’s tax information. Consolidated cash flow statement. The cash flow statement section provides an overview of all money transactions performed by the company over the past year. Accounting policies. These explain the rules that have been used to prepare the financial statements. Notes to the consolidated accounts. Many items in the balance sheet, income statement, and cash flow statement refer to explanatory notes. These notes are numbered and explain the items that they refer to in more detail. Parent company financial accounts. These are unconsolidated annual accounts that provide separate data on the parent company of the multinational, excluding all the subsidiaries. The order of these parts can be different and some companies include additional sections, such as a consolidated statement of recognised income and expense. Some future financial obligations may not be apparent from the balance sheet. If you try to interpret financial ratios, always compare them to the ratios of other companies in the same industry. What is relatively high in one industry may be low in another. Depreciation is booked by companies as a cost relating to the decline in the value of assets, or the allocation of the cost of tangible assets to periods in which the assets are used. The former affects values of businesses and entities. The latter affects net income.For income tax purposes, therefore, an investment is booked in company accounts as a prepaid expense, and depreciation is the allocation of that expense to future years. Since reporting depreciation to the tax office results in tax savings for companies, the way in which an investment is allocated over its lifetime is of critical importance to revenue. Accelerated depreciation rates are often used by governments to encourage specific investments. ‘Amortisation’ is the depreciation in the value of intangible assets such as trademarks. Timing differences that get reversed or ironed out over time, such as depreciation. Due to timing differences, tax payments get deferred. When a company will have to pay a lower amount of tax in the subsequent years due to timing differences, then such an amount is treated as a deferred tax asset on the balance sheet. 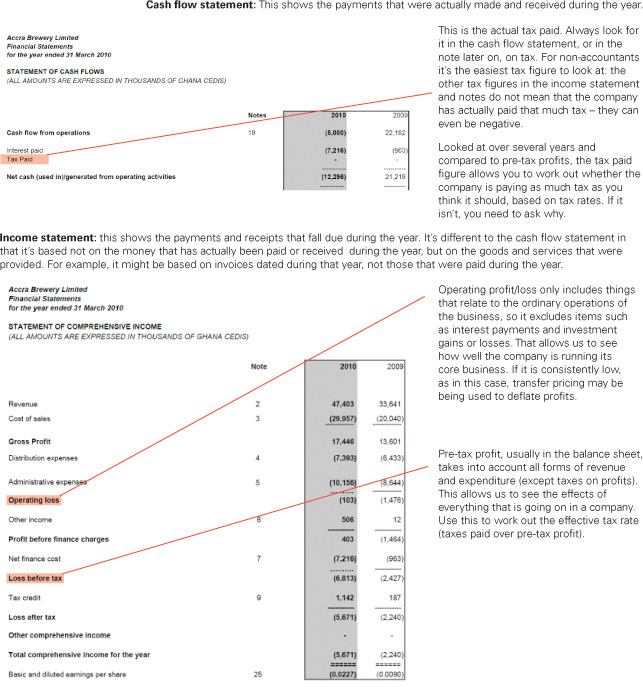 This section explains how to read an income statement. Not all companies give such detailed breakdowns as this example, but many do. ‘Payables’ are amounts owed at the end of the year, while ‘payments’ are the amounts spent during the year. This company has a controlling stake. 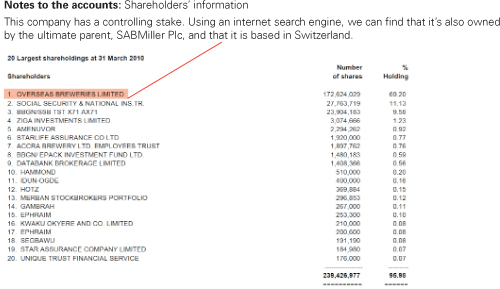 Using an internet search engine, we can find that it’s also owned by the ultimate parent, SABMiller Plc, and that it is based in Switzerland. Cash flow statement: This shows the payments that were actually made and received during the year. You may be able to glean a lot about a company’s subsidiaries at the country level. In some countries, tax courts hear cases brought by companies challenging the revenue authorities and put the relevant files online. It is important to check tax court cases, because they may require a company to put its tax return into the public record. Checking the company’s registry or registrar general and the Securities Exchange Commission is a good place to start. The single most useful item in subsidiary accounts is related party information. Transactions with tax havens will be visible. When considering this, a distinction needs to be made between transactions and payables/receivables. The latter is the position at the end of the year, and could be just a fraction of the total annual payments. As this information is in the accounts of companies at both ends of the transaction, you may be able to establish a pattern (for example, if there is a Dutch company that seems to own the group’s intellectual property). Having gleaned this information, you should be able to piece together a picture of whether a company is paying a fair amount of tax or whether it is structured to avoid tax. This is a complex area and you should be wary of making claims about companies that are not fully checked for accuracy and legal risks. The location of intellectual propertycan make it easy for companies to dodge tax. Because much of the value of a product lies in trademarks or brands, yet it is difficult to place a value on these, companies can easily locate intellectual property in tax havens and overcharge another sibsidiary for their use, thereby minimising the taxable profit of the subsidiary.You should look out for the location of intellectual property in national and international data. The World Intellectual Property Organization is also a useful resource (www.wipo.int/ipdl/en/madrid/search-struct.jsp).Thin capitalisation involves a company lending money to a subsidiary. If a subsidary is always in debt, the level of taxable profit is minimised. Companies based in tax havens can vercharge interest payments to related subsidiaries. In company accounts you should be able to see loans to related parties that may raise red flags. For company research, follow the same guidance on quality control as outlined above for government research. However, in addition it is crucial to be aware of risk of libel. When you provide the companies you have highlighted with the opportunity to review your report, this review process in itself can often deliver additional data, as managers often wish to explain the findings. In fact, you may actually use this process as a data collection technique, by posing additional questions to company representatives, or to float suspicions to see what response this will elicit. Keep your notebooks and any other documentary evidence (photographs, videos, CDs, tapes) indefinitely (in case they have to be submitted to a court of law). Once you have had your report checked by a lawyer make sure that you do not change the wording afterwards. Have it edited first so that last-minute changes don’t creep in. The standard advice in order to avoid litigation is to put all allegations made in the report to the company in advance of publication and to reflect the company’s response to each point in the final document. Avoid making allegations unless they can be proven beyond doubt. Instead you can ask questions about a company’s behaviour or suggest that there are questions that need answering. Follow the same steps as for government tax policy research reports. Pluspetrol in Peru – from environmental pollution to tax dodging? The oil industry in Peru has a chequered record. In a case at present going through the US courts, one industry giant is accused over a 30-year period of contaminating the rivers and lands of the indigenous Achuar communities – causing death, widespread poisoning and destroying their way of life. Another company operating in the same part of Peru, Pluspetrol, has placed rather more emphasis on community relations – setting up projects to improve health and nutrition for children, households and communities. Its aim is to reduce or eliminate social risks that may lead to violence or put its business activities at risk. However, even in the case of a company apparently taking corporate social responsibility seriously, it is not easy to determine who owns the company. When local campaigners started to research the company, they found out that Pluspetrol moved its head office from Argentinab to the Netherlands in 2000.They found the official documents that showed the company structure in databases rather than through publicly available sources, because Pluspetrol’s website did not provide the information. Because Pluspetrol does not have operations (production or sales) in the Netherlands, the campaigners wondered why the company would locate its head office there and turned to the Dutch Centre for Research on Multinational Corporations (SOMO) to find out more. Companies registered in the Netherlands are obliged to submit to the Dutch Chamber of Commerce an annual report that is more extensive than the annual report the company publishes on its website. SOMO searched in the Dutch Chamber of Commerce database for Pluspetrol, found a list of subsidiaries provided in its annual report and drew a company structure. Pluspetrol’s company structure showed that its subsidiaries in the Netherlands are so-called mailbox companies, indicated by the fact that the company does not have any employees and is hosted by a trust office, an organisation that provides mailbox companies with an address (a mailbox, rather than a physical office). Pluspetrol also has subsidiaries in secrecy jurisdictions, such as the Cayman and British Virgin Islands, Luxembourg and Gibraltar, which have no or very low tax levels and lack transparency. Although the location in secrecy jurisdictions is not a proof of any illegal behaviour, it indicates that the company may use financial structures for aggressive tax planning.This is a red flag for further investigation.